For the printing process, see Printmaking. 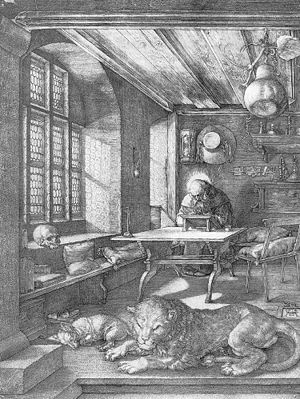 An engraving of St. Jerome by Albrecht Dürer, dated 1514. 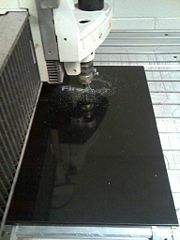 Engraving is the practice of cutting a design into a hard surface such as metal or wood. This process is often used to produce decorative objects made of such materials as silver, gold, steel, lacquer, or glass. In addition, the process may be applied to produce intaglio printing plates, of copper or other metal, for printing images on paper, which are called engravings. Engraving was a historically important method of producing images on paper, for both artistic printmaking and commercial reproductions and illustrations for books and magazines. It has long been replaced by photography in its commercial applications and, partly because of the difficulty of learning the technique, is much less common in printmaking, where it has been largely replaced by etching and other techniques. An assortment of tools used for hand engraving. Engravings may be described using various terms, such as copper-plate engraving and line engraving. In principle, these terms should refer to the same type of process. In the past, however, they were often used loosely to cover several printmaking techniques, so that many so-called engravings were produced by totally different techniques, such as etching. 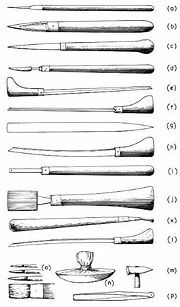 Engraving tools: (a) etching needle, (b) scraper, (c) and (d) burnishers, (e) graver, (f) scooper, (g) scraper for mezzotints, (h) stipple graver, (i) roulette for mezzotints, (j) shading tool for mezzotints, (k) roulette for mezzotints, (l) dry-point graver, (m) hammer, (n) dabber for applying the 'ground', (o) brushes for applying varnish, (p) calliper compasses. The tools used for engraving come in a variety of shapes and sizes that yield different line types. For example, a burin produces a unique type of line characterized by its steady, deliberate appearance and clean edges. Usually made of hardened steel, the burin is traditionally used to engrave copper plates. The angle tint tool has a slightly curved tip that is commonly used in printmaking. Florentine liners are flat-bottomed tools with multiple lines incised into them, used to do fill work on larger areas. Flat gravers are used for doing fill work on letters, as well as most musical instrument engraving work. Round gravers are commonly used on silver to create bright cuts (also called bright-cut engraving), as well as other hard-to-cut metals such as nickel and steel. Other tools—such as mezzotint rockers, roulets, and burnishers—are used for texturing effects. The earliest evidence of engraving, showing shallow grooves on metal, has been found on some jewelry dating to the beginning of the first millennium B.C.E. The majority of so-called engraved designs on ancient gold rings or other items were produced by chasing or sometimes a combination of lost-wax casting and chasing. However, the use of engraving to cut decorative scenes or figures into glass vessels appears as early as the first century C.E. It continued into the fourth century C.E. at urban centers such as Cologne and Rome,, then appears to have ceased sometime in the fifth century. Decorative work was first based on Greek mythology, before hunting and circus scenes became popular, as well as imagery drawn from the Old and New Testaments.. It appears to have been used to mimic the appearance of precious metal wares during the same period, including the application of gold leaf, and could be cut free-hand or with lathes. As many as 20 separate stylistic workshops have been identified, and it seems likely that the engraver and vessel producer were separate craftsmen. In the European Middle Ages, goldsmiths used engraving to decorate and inscribe metalwork. It is thought that they began to print impressions of their designs to record them. From this grew the engraving of copper printing plates to produce artistic images on paper, known as old master prints in Germany in the 1430s. Italy soon followed. Many early engravers came from a goldsmithing background. The first and greatest period of the practice of engraving was from about 1470 to 1530, with such masters as Martin Schongauer, Albrecht Dürer, and Lucas van Leiden. Thereafter, engraving tended to lose ground to etching, which was a much easier technique for the artist to learn. But many prints combined the two techniques—although Rembrandt's prints are generally all called etchings for convenience, many of them have some burin or drypoint work, and some have nothing else. By the nineteenth century, most engraving was for commercial illustration. Before the advent of photography, engraving was used to reproduce other forms of art; for example, paintings. Engravings continued to be common in newspapers and many books into the early twentieth century, as they were cheaper to use in printing than photographic images. Engraving has also always been used as a method of original artistic expression. Because of the high level of microscopic detail that can be achieved by a master engraver, counterfeiting of engraved designs is well-nigh impossible, and modern banknotes are almost always engraved, as are plates for printing money, checks, bonds and other security sensitive papers. The engraving is so fine that a normal printer can not recreate the detail of hand engraved images, nor can it be scanned. In the U.S. Bureau of Engraving and Printing, more than one hand engraver will work on the same plate, making it nearly impossible for one person to duplicate all the engraving on a particular banknote or document. The modern discipline of hand engraving, as it is called in a metalworking context, survives largely in a few specialized fields. The highest levels of the art are found on firearms and other metal weaponry, jewelry and musical instruments. In most industrial uses like production of intaglio plates for commercial applications, hand engraving has been replaced with milling using CNC engraving or milling machines. Another application of modern engraving is found in the printing industry. There, every day thousands of pages are mechanically engraved onto rotogravure cylinders, typically a steel base with a copper layer of about 0.1 mm in which the image is transferred. After engraving, the image is protected with an approximately 6 µm chrome layer. Using this process the image will survive for over a million copies in high speed printing presses. Typically the image is created in some PDF-like format and enters a work flow where it is processed and automatically imposed to the huge printing cylinders. Today up to 192 pages can be engraved on the same cylinder. Since the cylinder serves to print one color, four cylinders are typically used to print one side of the substrate. Rotogravure has a major share in publication, packaging and decorative printing. Engraving machines such as the K500 (packaging) or K6 (publication) by Hell Gravure Systems use a diamond stylus to cut cells. Each cell creates one printing dot later in the process. A K6 can have up to 18 engraving heads each cutting 8.000 cells per second to an accuracy of .1 µm and below. They are of course fully computer controlled and the whole process of cylinder making is fully automated. Today laser engraving machines are in development but as per today still the mechanical cutting has proven its strength in economical terms and quality. More than 4,000 engravers make approximately eight Mio printing cylinders worldwide per year. Traditionally, engravers created darker areas by making an area of many very thin parallel lines (called hatching). When two sets of parallel line hatchings intersected each other for higher density, the resulting pattern was known as cross-hatching. Claude Mellan is well-known for his technique of using parallel lines of varying thickness. 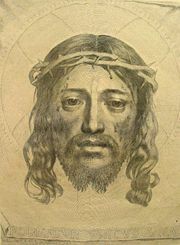 One notable example is his Sudarium of Saint Veronica (1649), an engraving of the face of Jesus from a single spiraling line that starts at the tip of Jesus's nose. The earliest allusion to engraving in the Bible may be the reference to Judah’s seal ring. (Ge 38:18), followed by (Ex 39.30). Engraving was commonly done with pointed tools of iron or even with diamond points (Jer 17:1). Each of the two onyx stones on the shoulder pieces of the high priest’s ephod was engraved with the names of six different tribes of Israel, and each of the 12 precious stones that adorned his breastpiece was engraved with the name of one of the tribes. The holy sign of dedication, the shining gold plate on the high priest’s turban, was engraved with the words: “Holiness belongs to Adonai.” Bezalel, along with Oholiab, was qualified to do this specialized engraving work as well as to train others.—Ex 35:30-35; 28:9-12; 39:6-14, 30. ↑ Abraham Bosse, 1645, Illustration of the use of a burin. (Text in French.) Bibliothèque nationale de France. Retrieved January 23, 2009. ↑ 2.0 2.1 B. Caron, 1993, A Roman Figure-Engraved Glass Bowl. Metropolitan Museum Journal 28:47-55. ↑ 3.0 3.1 S.J. Fleming, Roman Glass; reflections on cultural change. 1999, Philadelphia: University of Pennsylvania Museum of Archaeology and Anthropology. The Printed Image in the West: Engraving – The Metropolitan Museum of Art. This page was last modified on 23 August 2017, at 16:59.